Payday is finally getting back into action after the holidays, but boy do we wish that we were back in Mississippi this week where Southern organizers showed that they are building power. Mike Espy lost to Senator Cindy Hyde-Smith by a margin of only 8 points; making it the closest Senate race in Mississippi since 1988. Check out the excellent Mississippi Today for more. This week, campus workers at the United Campus Workers of Mississippi, an affiliate of United Campus Workers-CWA. They become the first higher education institution in the state of Mississippi to have a union. UCW started in the late 1990s at the University of Tennessee-Knoxville organizing professors, custodians, grad students, and cafeteria workers all into one big union. Despite lacking collective bargaining rights, through collective action and protest, they won major improvements and have successfully defeated bids to outsource campus work to private contractors. Now, UCW has expanded to Georgia and Mississippi. Workers at the University of Mississippi have worked closely with both chapters in forming their chapter and are excited about the future. Nissan Union Organizer Wins Rhode Scholarship – Becoming First Woman in Mississippi. A big congratulations goes out to Mississippi organizer Jaz Brisack, who won the Rhodes Scholarship, becoming the first woman in the history of the University of Mississippi to win a Rhodes Scholarship. In August of 2017, when Payday was down in Canton, Mississippi covering the union drive, we got to know Jaz Brisack, then a 20-year-old intern working on the UAW drive at Nissan. This week, Brisack made headlines when she became the first woman from the University of Mississippi to ever win the Rhodes Scholarship. As a radical feminist anti-racist union organizer from Mississippi, Brisack hopes to use her platform as Rhodes Scholar from Mississippi to inspire others to push for radical change. 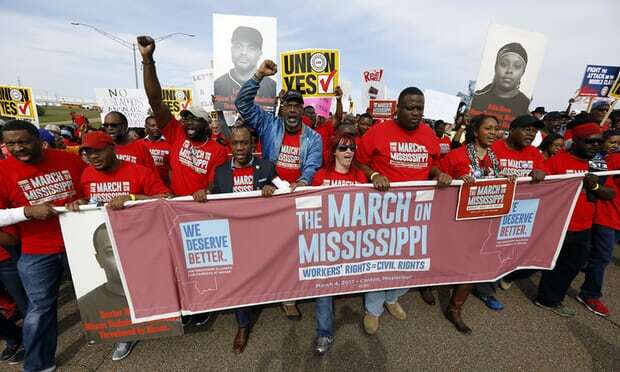 Up the Delta, in Memphis-area Shelby County, county employees won the right to a $15-an-hour minimum wage. Effective January 1, 2019, 340 workers including temp workers will get a raise as a result of the measure. “Being a single mom, $15 helps a lot in my household,” Felicia Jones, a temporary clerical worker, wrote in an Instagram post celebrating the victory. The move by the county puts pressure on the city of Memphis to pass a $15 an hour minimum wage for its employees. In March, the Shelby County School District announced a $15 an hour minimum wage for its employees. For more, check out the NewsGuild-represented Memphis Commercial Appeal. After Payday reported on the anti-immigrant funder Colcom Foundation prominently displaying sponsorship of the Pittsburgh Downtown Holiday Market, The Pittsburgh Downtown Partnership, a private-public partnership that operates events in public parks, is defending Colcom’s participation. Local immigrant groups have denounced the move. Folks, as many of you know, covering the Tree of Life synagogue massacre was the roughest day of my career as a reporter. As a kid, my bus stop was in front of the Tree of Life synagogue. I arrived at the scene while it was still an active shooter situation and was horrified. The collective horror and fear that I saw in the streets of a neighborhood that I loved all of my life was something I never experienced before in my life. I’ve covered coal mine explosions, the drug war in Brazil and while I saw horrible stuff, I wasn’t a coal miner or a drug trafficker. However, I was a Jew from that neighborhood and it felt like an attack on all of us as a political identity as Jews from a progressive neighborhood. As a PTSD survivor, I experienced a regression and really appreciate the support of my readers so that I could take some time off in November to sort things out. I am also very appreciative of the Committee to Protect Journalists for offering to see a psychiatrist, a great Jewish psychiatrist who was there that day too. It’s been really wonderful. Thank you all for all the messages of love and support. This week, the collapse of MIC showed why venture capital won’t save journalism, only our readers. Solidarity this week with the over 100 NewsGuild union member this week, who was laid off on a moment’s notice. In 2011, MIC was launched with much fanfare to be a publication geared towards millennials. The organization raised $60 million in venture capital funds and rented an entire floor of the World Trade Center in Downtown Manhattan. However, the publication struggled to gain an audience even after laying off most of its writing stuff as they shifted their resources towards making money with facebook videos. However, recent research has shown that Facebook has inflated its numbers and that the promised revenue from views and clicks never materialized. Yesterday, MIC was sold to Bustle for $5 million and Bustle announced that it would hire new staff to run the site. The moves by MIC’s ownership was met with outrage by the workers’ union, the New York NewsGuild. In February, workers at MIC unionized. However, they have yet to negotiate a first contract and many fear that the shutdown and sell to Bustle was done so as to prevent the union from moving to the new company. “This egregious act further exemplifies the need for media workers to stand together and demand better for themselves and their industry,” said the union in a statement. When I became KPFT news director in the mid-2000s, Ray was my mentor while I covered the beat he called “cops and courts and prisons and jails.” On Saturday, Uncle Ray, as he was known to many, died in hospice at age 78. His legacy of unrepentant rabble-rousing made Texas a more welcome place for the underdog. In 1971, Ray took a break to serve four years in Texas prisons for felony burglary and larceny, and Lee became KPFT’s first general manager. During Lee’s tenure, the Klu Klux Klan bombed the station’s transmitter and knocked it off the air not once, but twice. In prison, Ray hung out in the law library and successfully fought to knock his 160-year sentence down to 20, getting out early in 1975 with good behavior. Upon release, he stayed focused on liberation. Go to the Texas Observer to read the full obituary. The young lords of Lordstown found the assembly line — 35 second bursts of a dull, repetitive task, and a 5-second break before the next Impala or Vega rolled up — to be soul-crushing work. Botched cars — some of them slashed, deliberately sabotaged by angry workers — piled up in the giant lot outside the factory. A good chunk of the labor force had little fear of conflict with their bosses because they’d recently returned from the front lines in Vietnam. It all boiled over in March 1972. The frequent orders from Detroit to make the assembly line run faster, faster, faster finally caused the Lordstown workers to strike for 22 days. A work stoppage that cost GM $150 million made headlines from coast to coast and was dubbed by Newsweek as “industrial Woodstock.” When its music finally stopped, the young workers did win some concessions — mainly an end to the hated speed-up orders — but, more importantly, gained acclaim as avatars of a new generation of laborers who valued a more meaningful work experience over a few extra bucks every new contract. Be the first to comment on "Ole Miss Workers Unionize – Nissan Union Organizer Named Rhode Scholar – Memphis Wins $15 an Hour"